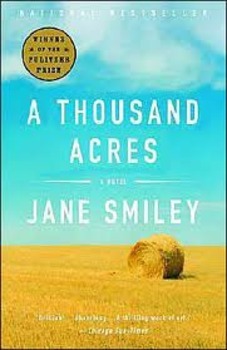 Three quizzes for A Thousand Acres by Jane Smiley, a modernization of Shakespeare's King Lear. Quiz #1 covers chapters 1-13, Quiz #2 covers chapters 14-24, and Quiz #3 covers chapters 25-end of the novel. Quizzes were written for AP level students, as they are asked to discuss thematic elements and analyze passages for literary techniques and theme development. The essay assignment offers students choices of AP-level prompts similar to the AP Lit Questions #3 Free Response Essay.